Recently, ThemeGrill blog team had completed a research on managed WordPress hosting services. And, also published a comparative review of 10 best-managed WordPress hosting services. From the first day of the research, we were extremely excited to find how fast managed WordPress hosting providers were growing large and popular in a short span of time. Among the fastest-growing hosting services, Kinsta was a great performer. Although Kinsta was founded just a few years ago (in 2013 to be exact), it has already earned a good deal of audience as well as trust from its customers. Backed up by Google cloud platform, Kinsta offers the latest and the finest managed WordPress hosting solution for all. Inspired by its cutting-edge technology and fully dedicated customer support, it is our attempt to provide a detailed review of the hosting. However, we have tried to put everything as it is in an honest manner rather than being professional. This is to make sure that it becomes useful for entrepreneurs planning to start a new website. To give you a quick glimpse of the organization of the post, here is the table of contents. You can simply click on any topic of your interest to directly jump to that section. How is Kinsta’s hosting environment? 1. Introduction – What’s Kinsta Hosting? 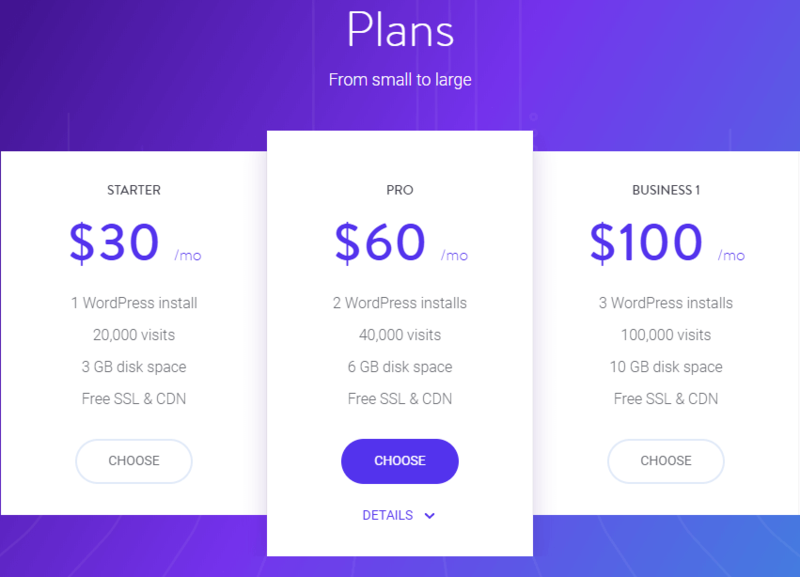 The tagline ‘Premium WordPress hosting for everyone, small or large‘ presents Kinsta hosting quite well that it offers high quality managed WordPress hosting plans suitable for both startups and big business companies. 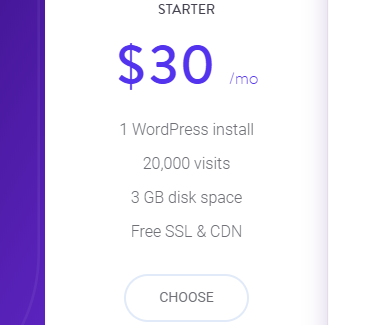 Yes, Kinsta exclusively provides ‘fully managed hosting’ for WordPress i.e. they manage all the technical facets of running WordPress including security, website performance, WordPress updates, backups, caching, SSL, CDN and all. And, the pricing is cost-effective and diversified starting from $30 per month (Starter plan) to $900 per month (Enterprise 2 plan). Let’s take a while to discuss the company and the team. As mentioned above, it was started just in 2013 by a team of WordPress experts who have actually contributed the WordPress core and overall community in a great deal. Actually, the team of innovative minds who wanted to push the hosting technology a step forward so they utilized a completely new infrastructure – Google Cloud platform, like nobody before. Kinsta is actually a trendsetter in the whole WordPress hosting history. Next, let’s check out Kinsta’s hosting environment in details. 2. How is the Kinsta’s Hosting environment? Kinsta hosting platform is far away from the traditional hosting categories which utilize cPanel for hosting dashboard. The entire Kinsta hosting infrastructure is built on the Google Cloud Platform and is very different from traditional shared, VPS, or dedicated infrastructure. Thus, Kinsta is away from the traditional/ standard cPanel technology and rather utilizes the next generation technology ‘Google Cloud platform’. In case you don’t know what Google Cloud Platform is, here is a brief description. # What is Google Cloud Platform? Google Cloud Platform is a suite of products and services including computing, storage, and databases, networking, data transfers, machine learning etc. The platform runs on the same infrastructure that Google uses for its popular high-traffic and global-scale services including Gmail, Maps, YouTube and search. With Google’s tireless effort into optimizing its infrastructure, Google cloud platform is undoubtedly one of the most powerful and highest-quality cloud infrastructures available on the planet. Marketed as ‘Better software. Faster‘, Google Cloud platform is doubtlessly becoming more popular day by day. 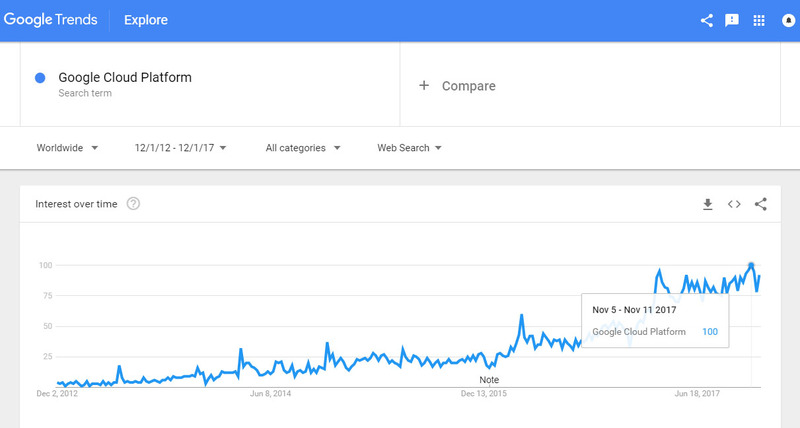 As an example, let’s consider how the search term ‘Google Cloud Platform’ in Google Trends over the 5 years. As shown in the screenshot above, it has gained huge popularity in the past couple of years. Following this trend, Kinsta hosting incorporates this technology for the WordPress users. So, utilizing the virtual machines in one of Google Cloud Platform’s multiple data centers, Kinsta ensures fast and secure transport of your data. You have the option to choose from 13 data centers for your site. Each of your sites can have a different data center as it utilizes multi-regional deployment. It allows you to place your website in the nearest geographical location to your visitors and therefore results in blazing fast load times. Talking about Kinsta’s software stack, it utilizes LXD managed hosts and orchestrated LXC software containers for each site. Every WordPress site is housed in its own isolated container with all of the software resources required to run it (Linux, Nginx, PHP, MySQL). Thus, the resources are 100% private and are not shared with anyone else or even your own sites as in shared hosting. Therefore, the enhanced security and speed are guaranteed. Power of Google Cloud Platform – an easy and efficient way to utilize Google’s super fast and super powerful cloud services. Speed obsessive architecture – use of technology like Nginx, PHP 7, LXD containers, MariaDB. Bullet–proof security – DDoS detection, Uptime monitoring, Hardware firewalls, SSL support. Uptime checks and backups – automatic daily backups and the option to create manual backup points anytime. Free site migrations – Move your sites without downtime with the support of expert migration team. Hack guarantee – Free hack fix. If a client’s website is hacked they’ll fix it with immediate priority. Staging environment – Easily test new WordPress versions, code, plugin etc. separately in the well-managed staging area. Caching – Full page caching at the server-level to deliver content almost instantaneously to visitors with Kinsta cache plugin. It is developed in-house to provide even more granular control over caching. Ready for E-commerce – Server-level rules and optimizations for WooCommerce and Easy Digital Download sites to ensure a smoother checkout experience for customers. Auto-scaling – It has a robust infrastructure (isolated software container technology) ready to handle sudden surges and traffic. Incorporating the best and latest technology, the features of Kinsta hosting are undeniably fascinating. Now, let’s discuss its pricing plans and the resources offered in the next section. Well, Kinsta is a managed WordPress hosting service aimed at providing complete management services as well as ample resources. So it is certainly more expensive than shared hosting services. However, if you look at the overall package including its top-notch support, cutting-edge technology and resources, the pricing looks very justifiable, actually cheap (at least for me). As shown above, in the image, it has multiple plans from small to large. The most basic plan is named ‘Starter‘ which costs $30 per month if paid monthly. It has discounted price of $300 per year if paid monthly. Pro – $60/mo. or $600/yr., 2 WordPress Installs, 40,000 visits, 6 GB disk space. Business 1 – $100/mo. or 1000/yr., 3 WordPress installs, 100,000 visits, 10 GB disc space. Business 2 – $200/mo. or 2000/yr., 10 WordPress installs, 250,000 visits, 20 GB disc space. Business 3 – $300/mo. or 3000/yr., 20 WordPress installs, 400,000 visits, 30GB disc space. Business 4 – $400/mo. or 4000/yr., 40 WordPress installs, 600,000 visits, 40GB disc space. Enterprise 1 – $600/mo. or 6000/yr., 60 WordPress installs, 1,000,000 visits, 80GB disc space. Enterprise 2 – $900/mo. or 9000/yr., 80 WordPress installs, 1,500,000 visits, 120GB disc space. All the other bigger plans do have the resources available in the ‘Starter‘ plan and certainly, more is offered on those plans. So, you can go to pricing page take a thorough look at all the pricing plans and choose the one that suits your purpose. 5. 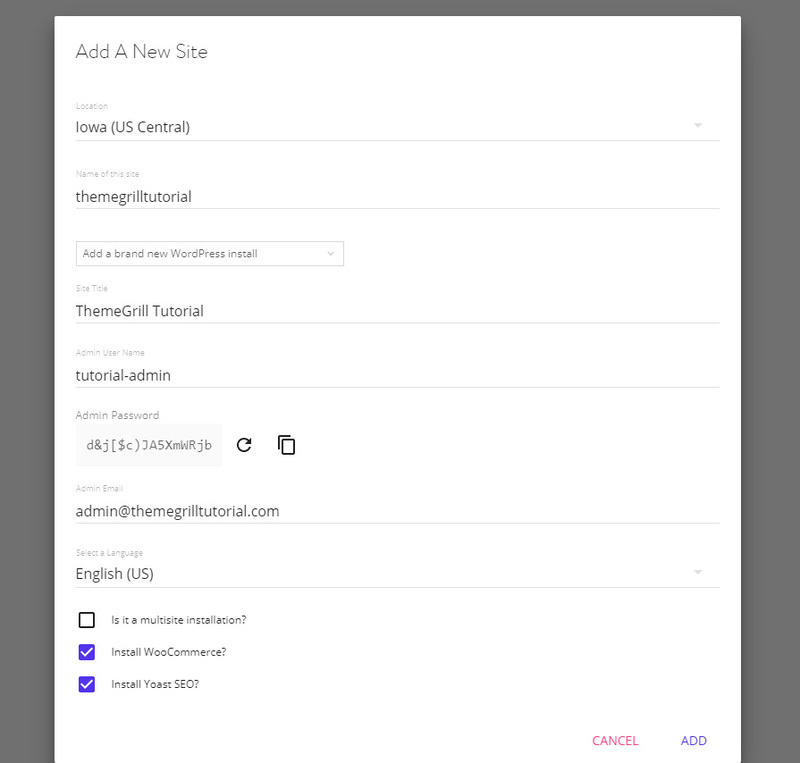 How user-friendly and simple is Kinsta’s interface? 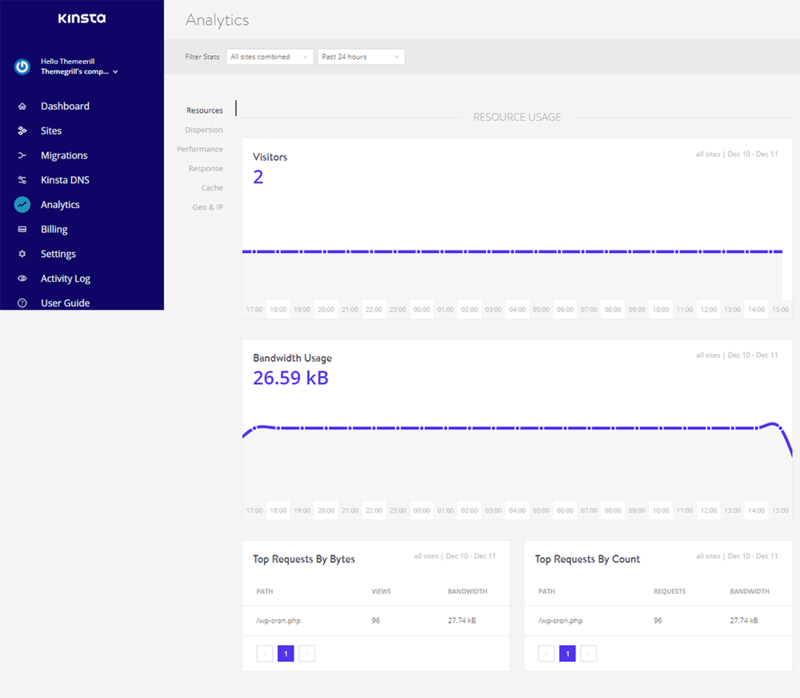 If you have had experience with shared hosting platforms, you will surely find Kinsta’s hosting dashboard exceptionally simple and easy. First, you don’t need to work in cPanel interface. For the professionals, working with cPanel may not be a problem but it is certainly not an easy pie. Second, the Kinsta dashboard interface is highly intuitive and user-friendly. Even a beginner can easily explore all its features and administer the hosting platform entirely. First things first, you need to add your own site. In order to add a site, go to ‘Sites‘ and click on it. Now you need to enter your website details. Fill in the fields and click on Add link at the bottom of the page. In case you want to migrate an existing site, all you have to do is go to ‘Migrations‘ and click on it. Next, you have to request migration. Site migration to Kinsta managed WordPress hosting can be completed in 7 steps as shown in the screenshot below. Well, the expert team will support you through the migration process, so there is nothing to panic about migrating site. Kinsta analytics is a very useful and important feature for tracking your website’s status and timely progress. It provides all the details about the resources usage, bandwidth usage, visitor dispersion over desktop and mobile, performance, cache, etc. With the live analytics, you can utilize the resources really well and also enhance the website’s performance. Besides, it has Kinsta DNS option which is a premium DNS service provided free for the hosting users. Billing details and activity log are also equally useful for a customer which all can be found in the Kinsta dashboard. So I conclude that it has a really simple and well-managed dashboard that is both easy to use and sufficient with everything required. The kind of customer support Kinsta offers is dependable. You can contact Kinsta support via live chat if you are already a Kinsta customer. Besides, you can ask your queries also via email. They respond to email queries as well with the same priority. On top of everything, they have an extensive knowledge base which is full of comprehensive tutorials and articles. So, you can have a solution to your queries most of the time over there. I think it’s very important to know what the customers as well as independent reviewers saying about a product before you purchase it. Well, reviews do have a great significance in the customers’ purchase decision. So, let’s take a while to discuss user reviews on Kinsta. First and foremost, let’s discuss clients and case studies page from Kinsta’s own website. Kinsta now hosts a remarkable number of big businesses and their reviews as a customer are fully positive and promising. Websites like Superluchas – a Mexican magazine, The Sport Review – British sports news website, aThemes – a WordPress development company etc. use Kinsta to host their website and they are happy with the Kinsta’s services. Moreover, you can get more reviews on Kinsta’s services if you simply search them on Google/ search engines. Just search ‘Kinsta WordPress Hosting review’ and a number of articles will appear. You can read them before you switch in with Kinsta. Based on our experience using Kinsta and thorough review, we come to conclusion as mentioned below. Check out the table in the right for the summary. Just like WordPress, Kinsta also focuses on the simplicity and user-friendliness. Kinsta’s independent dashboard is precisely a pleasant experience to work with – the clean, comprehensive and highly intuitive interface. Next, use of latest technology ‘Google Cloud platform’ is phenomenal as it changes the way hosting has long been (based on cPanel). Due to the finest infrastructure Google cloud offers, the websites hosted on Kinsta are sure to be security-proven, and high-performing. Pricing is reasonable – costlier than shared hosting but the resources and power offered by Kinsta certainly justify the price you pay. Similarly, support is genuinely dedicated at Kinsta. Their expert support is ready for service 24/7/365 days. So, I conclude that Kinsta is a perfected hosting service, probably the best managed hosting platform for WordPress. It is surely a great option ahead of you if you are planning to start a new WP website or want to change your existing host. Kinsta is one of the best managed hosting environment and all I have heard about them are good things. They recently created lower plans for bloggers and for under $25/month they’re the best host available. Kinsta hosting is offering some very useful features, specially for beginners. These four features are amazing. – Hack guarantee – Free hack fix. – Caching – Full page caching . Which they offer for free, i have seen web hosting company charge for site migration. and don’t fix hacks for free. Ready for E-commerce is also time saver. and full page caching will load the page fast. Kinsta hosting can be best suit for wordpress websites. An amazing article. It’s nice to read a quality blog post. I think you made some good points in this post. A kinsta host, or web facilitating specialist organization, is a business that gives the advances and administrations required for the site or site page to be seen in the Internet.